Indian Feudatory State of Cooch Behar. 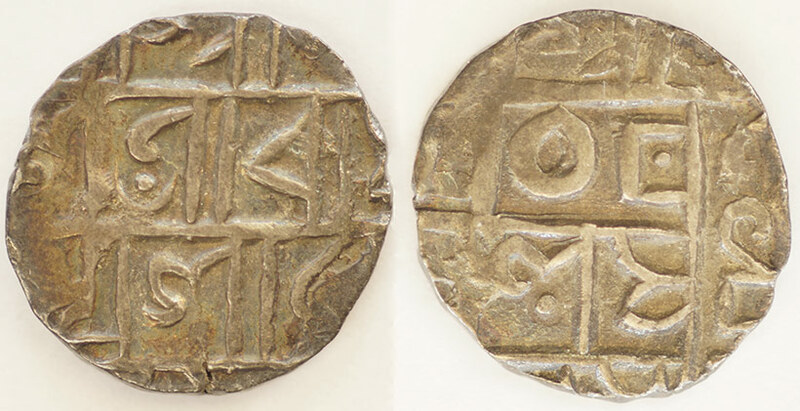 Sold to me as a half Rupee of Maharaja Prana Narayan (1633 - 1665) but my exam of KM would indicate it's probably issued under Rupa Narayan (1695 - 1715). In any case I acquired it to illustrate the type of coin used to model the Bhutan series on. This may be written in 'devanagari' script. Holding off on the legends until I can determine the actual ruler.